What should you be thankful for, what should you be thankful for the MOST, huh? This last Sunday our pastor talked about being thankful, but not just for the 'creatED' things, but especially for the 'creatOR' things. Let me esplain: Created things would be like friends, your house, your computer, your dog, etc. The Creator things would be like Christ's love, and his sacrifice. On Sunday, our pastor came up with this list to help you: I named these the SIX PACK. Man Isn't that awesome! It better awesome to you, otherwise you might want to go home and re-think your life! So try not to get so wrapped up in the CreatED things and focus more on this list. Oh, and for a Thanksgiving gift, I put up a few new songs on the side. And be sure to listen to Rescue! Great post, love the picture! Got something for you guys on my blog! Okay, Okay, sorry, that was dramatic, but still I'm not huge on the westerns and all!!! We truly have much to thank God for! 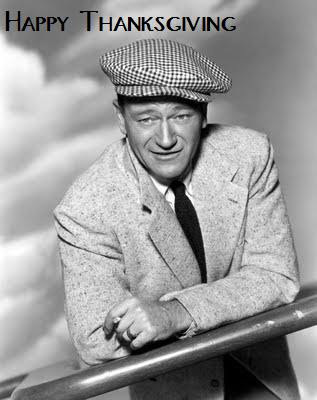 (By the way, John Wayne is one of my favourite actors, but for some reason I laugh each time I see the pictures. After "Hondo" and "The Quiet Man", I wonder which one will be next...). It seems as if Kade is doing all the posting on this blog lately. Do you think you will ever do as many posts as you did when you first started the blog? Just to encourage you, we can do all things through Christ who strengthens us!! I think you all are doing great in encouraging all your readers. God Bless you!